Chris McLeish scored the only goal of the game as Elgin started their Ladbrokes League Two campaign with a 1-0 win at Cowdenbeath. Last year's beaten play-off semi-finalists had lost three of their four games in the run-up to the league opener, but McLeish's first senior goal was enough for the Black and Whites. Chances were few and far between at either end in the early stages, with Shane Sutherland and Nickolay Todorov enjoying the best chances. However McLeish, who was recalled to the side after being rested in the Betfred Cup defeat to Stirling, slotted into the bottom corner with his left foot just after the break the open the scoring. 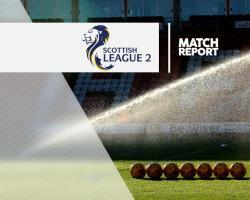 Cowdenbeath, attempting to avoid a third successive relegation, could not level things and fell to a more-damaging defeat.